Set on a seaside bluff overlooking the Pacific Ocean in Rancho Palos Verdes, the Wayfarers Chapel is a spectacular glass church, surrounded by lush landscaped gardens and impressive redwoods. Sponsored by the Swedenborgian Church, this non-denominational chapel is for couples of all faiths, designed by renowned architect Lloyd Wright. The design was inspired by the redwood forests of Northern California which Lloyd Wright explored following World War II. He wanted to create a natural sanctuary where the surrounding trees and plants were as important as the architecture itself. The property includes a Forest Floor Garden, which features ferns, irises and rhododendron - all of which are found in redwood forests - as well as a rose garden which includes lilies, crown of thorns and aloe - plants which are mentioned in the Bible. Today Wayfarers Chapel is listed on the National Registry of Historic Places, recognizing its outstanding legacy and making it one of Southern California’s most sought-after wedding venues. The timber and steel frame is entirely encapsulated in glass, with the gorgeous natural surrounds and blue skies viewed from the interior. The glass catches the sunlight (or candlelight by night), reflecting off the walls and illuminating the setting. 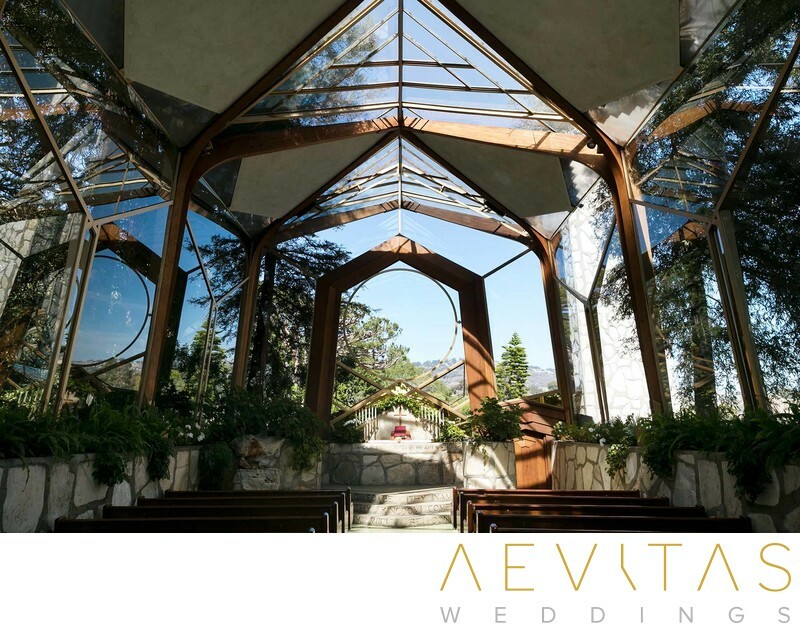 Wooden furnishings and Palos Verdes stone complete the rustic ambiance, combining to make an awe-inspiring church that is like no other. From the Visitors Center, a stone path leads through a stunning tree-framed walkway to the chapel itself, providing an unforgettable entrance for your guests. There are separate rooms for the bride and groom to relax with their bridesmaids and groomsmen before the ceremony, while a Pacific Ocean facing colonnade is the ideal spot for first look sessions. The surrounding 3.5 acres of landscaped gardens not only creates a tranquil setting, but provides a gorgeous backdrop for couple portraits. The Wayfarers Chapel can host around 100 guests, making it ideal for more intimate wedding celebrations. As an incredibly popular venue, event times are strictly limited to two hours, including setup, cleanup and portraits. Their highly experienced staff are on hand to guide you every step of your wedding day planning process, while their Chapel Ministers are available to conduct services and meet with all couples in the lead up to their special day.